This is indeed a creepy sight, something like Pee Wee Herman meets David Lynch. I asked both Chris and Andy what exactly the reality ride was all about. 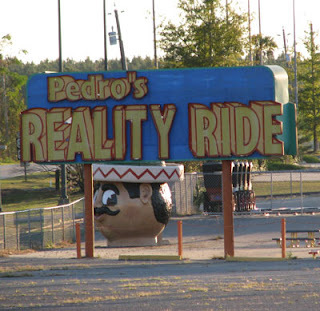 They told me that they couldn't discern any actual ride, but that they just assumed it had something to do with the giant freaky Pedro head behind the sign. Be sure and check out Chris and Andy's South of the Border adventures at Chris's Invincible Super-Blog. Your life will never be the same afterwards.